Thank you for a great winter, reopening Friday, May 10. Open at 5:30pm, 7 Nights a Week. The Cafe Diva family is taking a few weeks to reflect upon a busy winter, and prepare for our spring reopening Friday, May 10. In celebration of twenty years in businesss, our Spring Menu is comprised of favorite dishes from past spring menus. Fresh produce sourced from family farms, meats from regional ranches and sustainably harvested seafood grace the table. At Kate's side is a culinary team dedicated to your enjoyment, happy to accommodate gluten free and vegetarian/vegan dietary preferences. Our intimate dining rooms afford limited availability, reservations are suggested. To commemorate twenty years serving Steamboat Springs, our Spring Menu is made up of favorite dishes from past spring menus, dating back to 1998. We are truly grateful for the many friends, and memorable moments we have shared, ENJOY, and thank you for twenty wonderful years! Our cellar is filled with over 300 selections, sourced from the world's great vineyards. Three sommeliers pair to your taste, meal and budget. Visit our Winelist page. Café Diva will reopen for the spring, Friday, May 10, seven days a week, seating from 5:30pm until 9pm. Seating is limited, reservations are recommended. Our four seat bar is seated on a first come, first served basis. Regrettably, online vendors claim to offer Café Diva gift certificates, which may not be redeemable. Gift certificates issued by Café Diva are only available by phone, 970.871.0508. Share the gift of Diva! As a special thank you to our many friends, Café Diva is pleased to announce the return of Date Night, Sundays, May 12, through June 16. The Café Diva journey began December 1, 1998. Starting as a wine bar serving appetizers, we have evolved into something different. We hope you feel as we do, something special. Dining is more than simply eating and drinking. Rather the perception of flavor, the uniqueness of the moment, the true joy of dining are made by those with whom the moment is shared. Over the past twenty years we have been honored to share these moments with you, and we thank you. Looking forward, we strive to respect our very special relationship with you, to challenge ourselves to be our best, to make many more special moments. 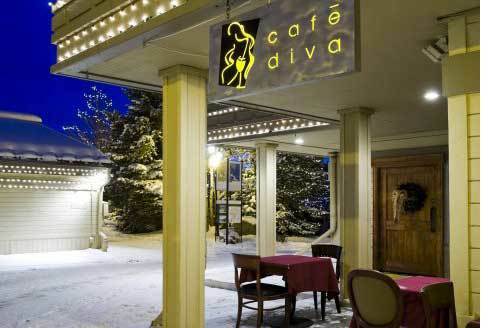 Café Diva, Steamboat Springs, Colorado . . . Cuisine, Wine and Spirits, Artfully Crafted and Presented. Chef Kate Van Rensselaer Rench first expressed herself through humble mediums with a BFA in sculpture and ceramics. To help support her art studies she starting her career in the kitchen, flipping burgers at the Mountain Sun Pub and Brewery in Boulder, CO, where she discovered her passion for cooking. She went to the French Culinary Institute, New York City, in February of ’98. After graduating with the Jacques Pepin award in September of the same year, she began her career at Jean-Georges Restaurant (Jean-Georges Vongerichten’s signature, four star restaurant in Manhattan). It was there that Chef Kate first felt her expression completely realized; technically innovative, delicately prepared French-Asian fusion cuisine. After one year at Jean-Georges, Chef Kate was promoted to Chef de Partie of Garde Manger, where Kate remained for the next two years. Next, she spent two years as the executive chef at Hayday Country Market/ Balduccis in Westport, CT, where she managed a high volume prepared foods department. Missing the mountains, she found herself back in the serenity of Steamboat Springs, CO, where she became part of Café Diva. After six months cooking here, Kate was offered the Executive Chef position and eventually partnership. Through her fresh, flavorful, seasonally changing menus, Chef Kate has earned top marks nationally with connoisseurs and critics, and most importantly Steamboat locals. Since expanding the restaurant (we started with four tables), Café Diva has moved to the pinnacle of dining in Colorado, yet remains quaint in its destination, the Northern Rockies. Chef Kate balances her culinary career with her husband, Craig, her two dogs and her maniacal pursuit of mountain sports.